INTENDED USE: for the removal and installation of single, tandem and duplex tires and wheels which are mounted on trucks that are supported above ground level. Heavy duty lift arms made with ball bearing conveyer rollers which allow easy rotation of wheels for alignment with bolt pattern. 7-1/2" of side to side lift arm adjustment eliminates the trail and error method of aligning the rims' lug holes with the wheel drum. 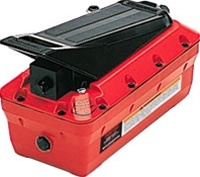 A 1,500 pound capacity heavy duty winch with 5 to 1 gear ratio provides ease of operation. The winch gear design acts as a brake and allows the load to be lowered incrementally if desired and without the need for constant hand pressure against the crank handle. 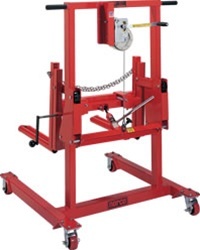 A hydraulic jack tilts the lift arms to match the angle of the spindle. 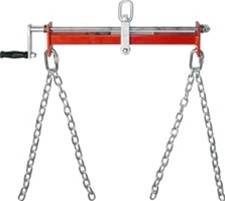 Safety chain provided to secure tires and wheels to the dolly. Maneuverability is made easy by means of two rear mounted ball bearing caster wheels. The caster wheels include a locking mechanism which can prevent the dolly from moving. Capacity – 1/2 Ton, Lift Height – Low 3" High 41.25", Lift Arms – Width 24.25" Length 21" Tilt Angle -2 to +30 degrees, Side to Side Adj. – Left 3.25" Right 4.25", Overall Dimensions: 45.75"L x 43.75"W x 62"H, Support Leg Clearance – 6.25"
Be the first to review “NORCO 82302B 1/2 TON CAPACITY HIGH LIFT WHEEL DOLLY” Click here to cancel reply.